This article describes the antihyperglycemic activity, in vivo antioxidant potential, effect on hemoglobin glycosylation, estimation of liver glycogen content, and in vitro peripheral glucose utilization of bacosine, a triterpene isolated from the ethyl acetate fraction (EAF) of the ethanolic extract of Bacopa monnieri. Bacosine produced a significant decrease in the blood glucose level when compared with the diabetic control rats both in the single administration as well as in the multiple administration study. It was observed that the compound reversed the weight loss of the diabetic rats, returning the values to near normal. Bacosine also prevented elevation of glycosylated hemoglobin in vitro with an IC50 value of 7.44 µg/mL, comparable with the one for the reference drug α-tocopherol. 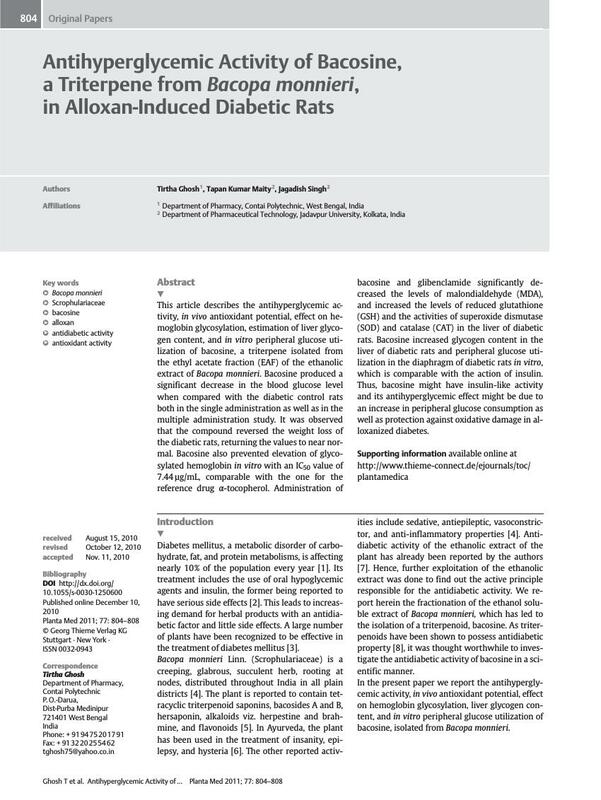 Administration of bacosine and glibenclamide significantly decreased the levels of malondialdehyde (MDA), and increased the levels of reduced glutathione (GSH) and the activities of superoxide dismutase (SOD) and catalase (CAT) in the liver of diabetic rats. Bacosine increased glycogen content in the liver of diabetic rats and peripheral glucose utilization in the diaphragm of diabetic rats in vitro, which is comparable with the action of insulin. Thus, bacosine might have insulin-like activity and its antihyperglycemic effect might be due to an increase in peripheral glucose consumption as well as protection against oxidative damage in alloxanized diabetes.